One-stop Modification Car Full Body Kits. Carbon fiber item is Surface glossy finished. Use 3K twill weave real carbon fiber material. FRP fiber glass item is White or black unpainted semi-finished. Must to be primed & painted before fitted, scratch is not quality issue. Destination duty not included in price (EURO will charge import duty). Due to handcrafted product please accept minor adjustment while fitting. Recommend professional body shop for installation. 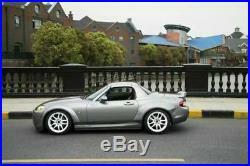 Welcome to share us the items fitting into the car after you install it. Please Don't open case or leave negative/neutral feedback without communication with us. Delicate handcraft by carbon fiber. Good Packing For Safe Transportation , Inside wrap with bubbles , then pack with standard carton box. Specialist on body kits and carbon fiber products. Was established in 2004 and has now become one of the most well-known automotive styling equipment suppliers in Europe. We have direct access to more than 30 manufacturrs from the Far East including Japan, Hong Kong, Taiwan, Korea and China, which specialise in body styling and providing performance parts dedicated to Japanese vehicles as well as European ones. In 2008, we invested and opened our own manufacturing facility in Shanghai, China, which has been supplying all kinds of FRP and carbon fibre products to customers worldwide. We have also set up an office in China in order to deliver our services to customers around the globe more efficiently. EPR International Company Ltd was registered in 2010. Dry Lay up Vacuum Infusion Progress, we adhere to the strict system of quality control in our operations, from the sourcing of raw materials to production, packing, inventory storage. Allocate the top grade production machines in the domestic, have topranking production technology engineers, technicians and researching and developing group in order to provide high quality standard products. Professional logistics team, professionals in various respects, first-class management team, logistics network system, careful packaging master, all of which has assured the customers of a comprehensive service. Our stock level change all the time, so we CAN'T guarantee all items are in stock, please feel free to contact is to check the availability. We DO NOT take any responsibility on the damage during transit if item was signed as normal. Due to characteristic of carbon manufacture, tiny air bubble, wavy weave or blemish on the clear coat is inevitableand we DO NOT classify this as im-perfection. Due to all these item are handcrafted molding and production, little adjustment, sanding, trimming or cutting might needed. 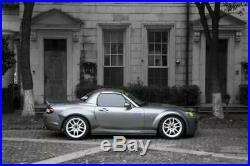 The item "For Mazda MX5 Roaster Miata NC FRP TP Style Front & Rear Fender Flares Kits Part" is in sale since Thursday, December 6, 2018. This item is in the category "Vehicle Parts & Accessories\Motorcycle Parts\Bodywork & Frame\Mud Guards & Fenders". 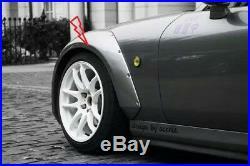 The seller is "carbon_bodykits" and is located in Guangzhou. This item can be shipped to United Kingdom, Japan, Canada, Australia, Germany.